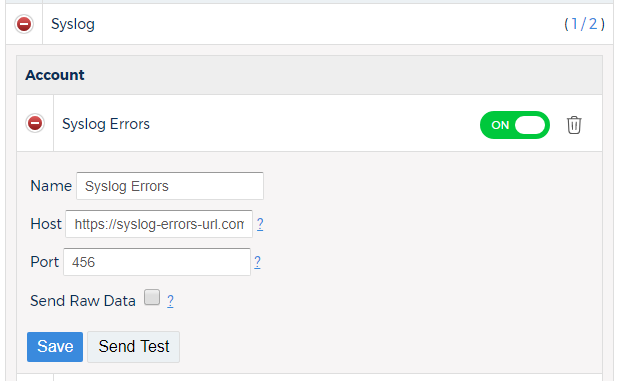 The integration with Syslog allows you to configure email notifications that you can receive daily or any time there is a change to a Best Practice Check or alert. To learn how to configure your integration with Syslog, review the procedure. From the drop-down menu, select Syslog. Type the name of your Syslog account. In this example, since there were no previous integrations; your newly-entered account is the only listed account. A yellow circle with an exclamation point inside ( ) indicates that you need to provide additional information before the integration is complete. Only applies to CloudTrail alerts. Will send the original JSON file received from AWS. You will receive a Syslog message upon successful configuration.